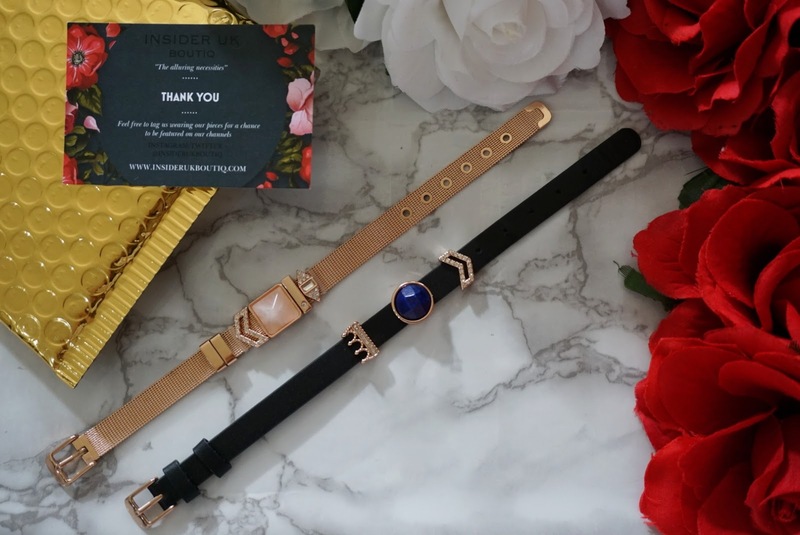 I am so excited to announce the exclusive release of the high quality bracelet sets by Insider UK Boutiq. Insider UK Boutiq excels at the provision of high quality bracelets. Part of the range offered to me is part of their Slider Charm Bracelet collection. Firstly and foremost the bracelets come delivered in a beautiful gold bubbled envelope. Can we really judge a book by it's cover? Inside the package there was a beautiful flower patterned thank you card. Each bracelet set comes in it's own black velvet pouch. Each part of the items was sealed in it's own plastic wrap, which is very nice as it allows to open and discover each piece one by one. 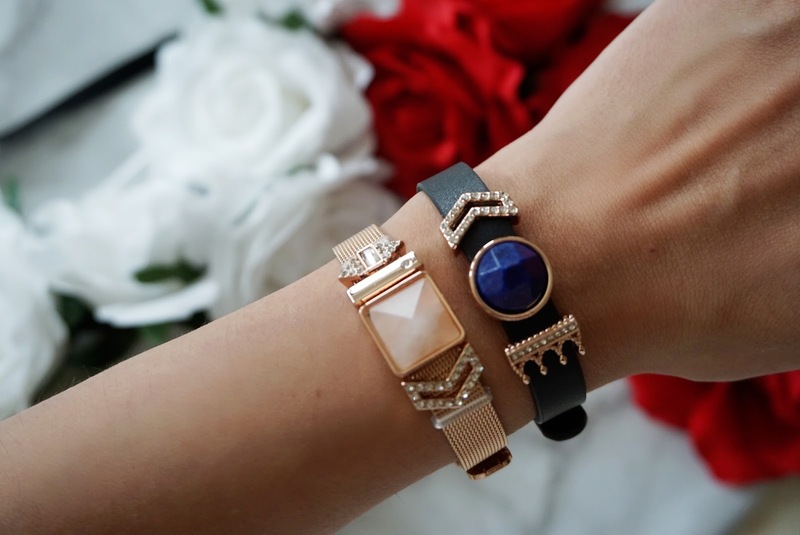 The collection is very much based over a Rose Gold Theme and all of these are slider charm bracelets. The high quality slider charm bracelet consists of a black genuine leather strap which fits 10mm size charms. The bracelet size is of 10mm by 21.5cm. 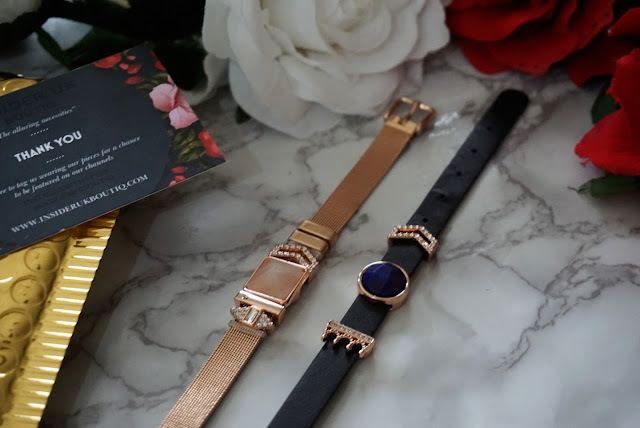 The bracelet buckle have a rose gold finishing. This set comes inclusive of the 3 rose gold charms. One charm is a navy blue oval, one is a sparkling crown and one is a sparkling arrow. I particularly enjoyed the fact that the charms are quite a semi tight fit so they stay well put. 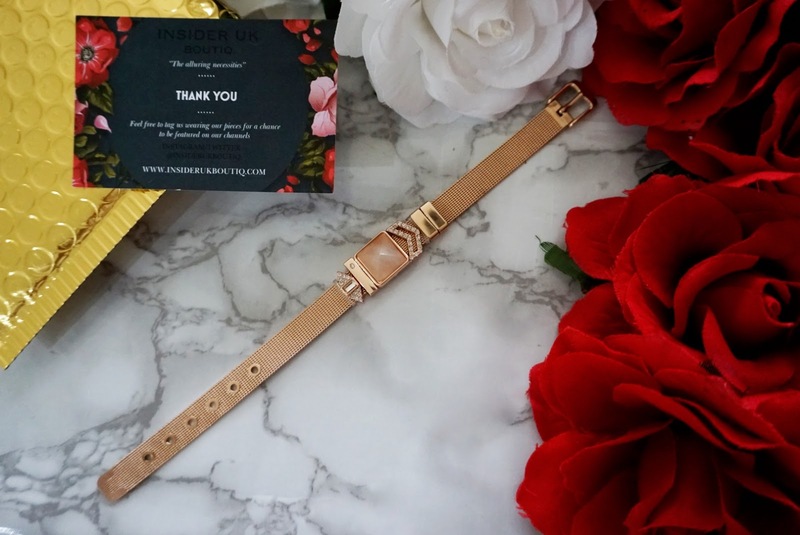 This is one of their best selling pieces as the brown leather strap sold out in it's first day of release. Prior to my receipt of the item, I had an idea of what the product would look like. Upon receiving it, I couldn't believe how the pictures did NOT do the bracelet justice. 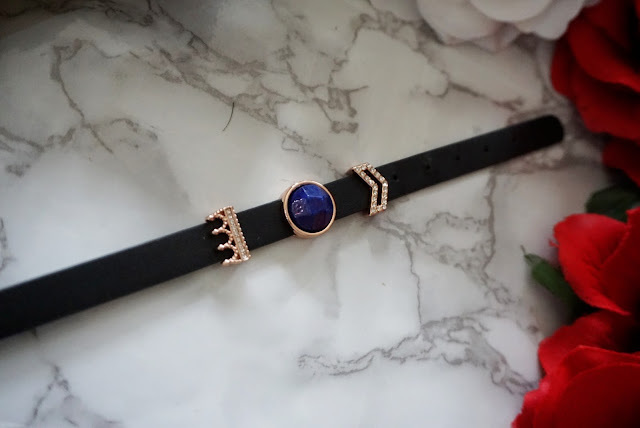 The bracelet is so beautifully crafted and the rose gold finishing are just divine. Words cannot even explain how luxurious it looks. I cannot express how much I adore the fact that it comes inclusive of the 3 charms, because to be honest I would struggle making a choice to try and make it look pretty. So, in my case that's a huge weight taken off my shoulders. 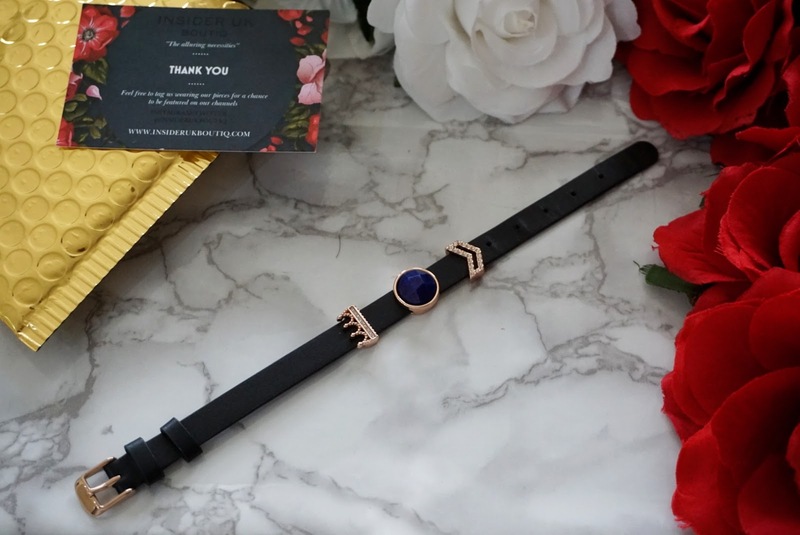 This particular bracelet is Insider UK Boutiq's number one seller so much so that occasionally you may need to be on waiting list to get yours. 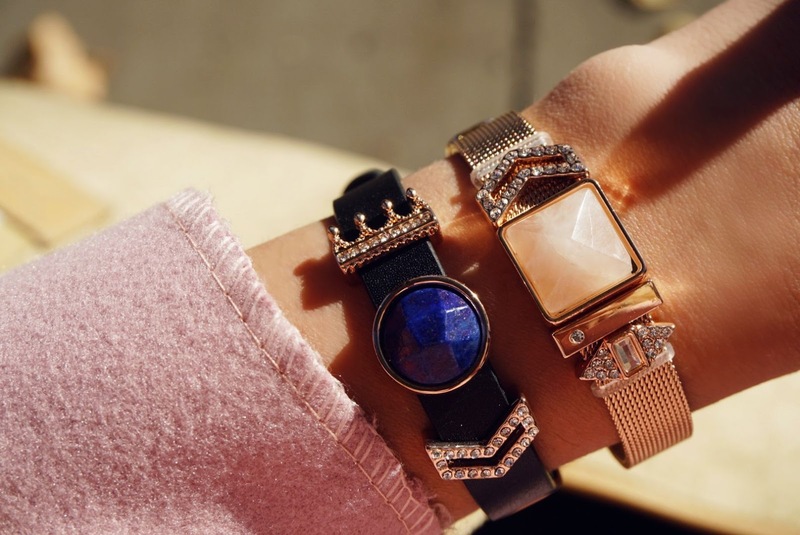 Unlike the crown sparkles charm bracelet this high quality bracelet comes in a form of stainless steel mesh material. Again the colour theme is a Rose Gold one. The bracelet is a 18cm x 0.8cm. 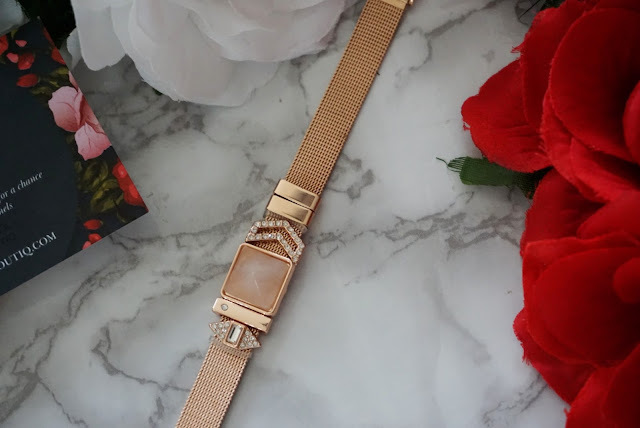 The unbelievable thing is that this particular model comes inclusive of 4 Rose Gold colour charms. One slider charm is a sparkling arrow, one is a pink large square, one rose gold thin bar with a single sparkle zirconium stone and double ended arrow with a middle crystal and sparkles on each end. I loved the fact that this particular bracelet set comes inclusive of 2 semi transparent sliding charms stoppers. Keeping all those beautiful charms in place. Again as per the previous bracelets case, it was way more breathtaking in real life!!!!!!!!!! It is truly a wonderful bracelet and can't get over how much it glistens. A true little gem to own. Insider UK Boutiq has done a great job when it comes to quality and design. They have thought of all the aspects surrounding the product. For starters, they have nailed all the packaging. I love that the envelope as soon as it arrives already gets you excited as it a pretty gold one. Secondly, each bracelet set comes in it's own bracelet pouch and within the bracelet pouch they are enclosed in plastic pouches. I love that they have gone as far as providing you with an adorable thank you card. Definitely thumbs up to getting all the details on point. I couldn't believe how well made the bracelets were. The finishing are flawless and the polish on the bracelets is divine. The charms are by far the best I have EVER owned as they truly sparkle. You are speaking about real zirconium. When the light shines of them, they truly stand out. I was even stopped whilst shooting in Chelsea by two girls as they wanted to know where I purchased them. It's amazing how much more beautiful they are in real life rather than on photographs. In terms of pricing considering the quality , I am surprised that they don't cost more than they actually do. I highly recommend Insider UK Boutiq not only are they professional but they also provide high quality bracelets. Use my code for an outstanding 25% Off. Get yours whilst stocks lasts. Have you ever tried any of their products? If so would you agree with me? These products were sponsored for review purposes , however all opinions are my own and an honest portrayal of my experience with them.